In August of 2013 the city of Yilan (Taiwan) will host a Celebration of the Tyrant’s Giant Creatures! For this special occasion, the Tyrant of Cardboardia has tasked his citizens to bring about a complete and radical change in the events, conditions and emotions of daily life. To achieve this goal, the Cardboard Technological Research Laboratory has been established on the Island of Taiwan to investigate the transformation of ideas into objects, the transition between flat and multi-dimensional actions, and the movement between unconscious and conscious states. The laboratory staff will be engaged in the preparation of the Grand Metamorphosis Procession, which will take place under the influence of the moon and several Dream Machines. For this project, the Cardboardia Technological Research Laboratory will consist of the “Department of Natural Laws”, responsible for the creation of the Cardboard Moon, which will guide the procession, and the “Department of Irrationality” responsible for catalyzing movements of the unconsciousness. Tyran's Parade in Moscow. Presentation of Cardboard Mechanical Engineering! Cardboardia national celebration. Taiwan. 2013. The Country of Cardboardia can boast very strong traditions! For the second year we are now going to have our National Celebration - "Day of Tyran’s Giant Creatures”. In 2012 we celebrated it in Gorky Park, in the City of Moscow. This year personages of Cardboardia will hold the celebration on the island of Taiwan on a usual large-scale extent from June 28th until August 10th. We are inviting residents and guests of Yilan city to join Cardboardia personages for the creation of Giant Creatures and Smaller Creatures, so that on 10th of August several thousand people could attend the Celebration and the Grand Parade in honor of Yilan city and commemorate presence of Cardboardia at the International Lohas Festival 2013. Cardboardia is a country without territory but with a very creative population. 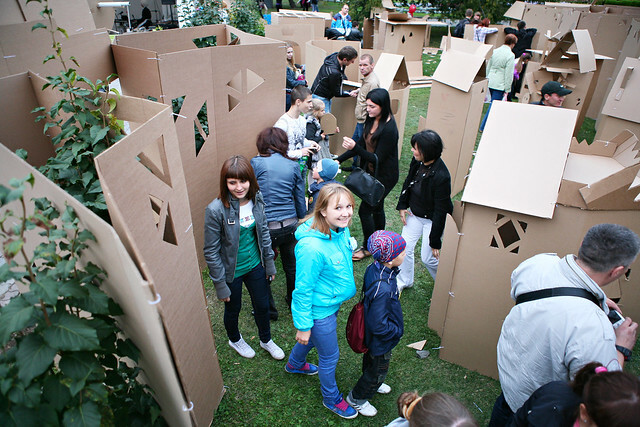 Wherever we come to build Cardboard towns or to organize Parades, Performances and Celebrations we are inviting all and everyone to join us in order to share creative experience in designing, building and improvising with cardboard and ideas. Join us to experiment and explore the amazing world of cardboard! Create, Earn, Play! Make your artistic dreams come true with Cardboardia! To register please fill in an online form. Interview with Tyran of Cardboardia made by inspiration-of-the-nation.com. 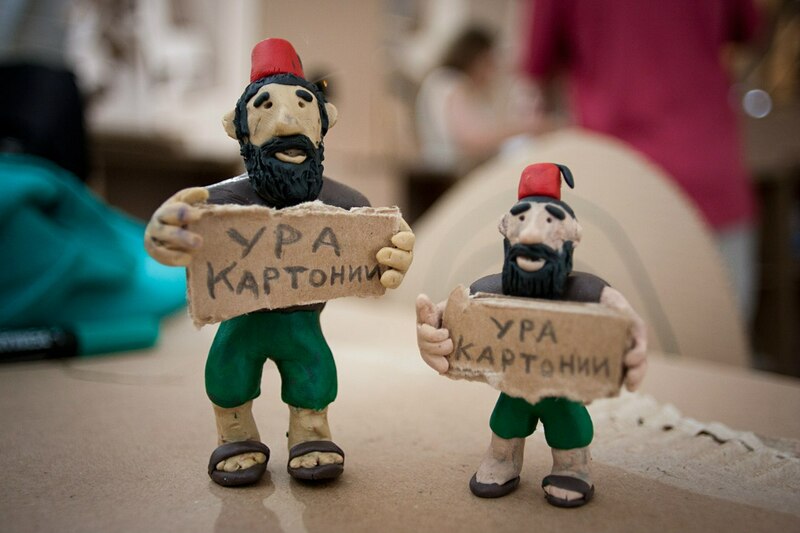 "Sergey Korsakov (aka the Tyran of Cardboardia) is the creator and curator ofCardboardia, a social network that organizes Cardboard Towns - some city festivals with social effect. A lot of questions and a lot of answers below. Many thanks to Sergey who helped us understand more about all these happenings. Discussion, seminar as a part of “Made in Cardboardia” program "Complete Cardboard"
Art Talks: territorial development in practice - an unusual approach. Territorial development in practice - an unusual approach. How to work with local communities, how to organize temporary or permanent large-scale events, how to reach out and work with meaningful partnerships, networks & volunteers. Cases examples: Sideways Walking Arts Festival (Belgium), Nikola-Lenivec (Russia), Materialization of Cardboardia (Russia).